A contract between the counsellor and supervisor is essential. Not only does it ensure boundaries are kept but enables a solid working alliance between the supervisor and supervisee. A contract should be underpinned by an ethical framework, such as the BACP framework. This allows the supervisee to explore freely their fears and reflections on their work. Additionally it encourages the supervisor to reflect in-depth on whether they are maintaining a balance between taking appropriate responsibility for the supervisees work and the clients well being. Alongside this supervisors need to question themselves to whether they are competent to supervise the work. The ethical framework encourages good practice on both sides. A cooperative working partnership is essential. It enables the supervisee to inspire to be the best counsellor and ensure the supervisor guides the counsellor to reflect rather than ‘police’ the supervisees’ work. Yes, the supervisor will have more experience but she/he must not show inferiority or superiority or it will destroy the balance of the relationship. It is not helpful for the supervisor to always say ‘this is how I do things’. Supervisors need to encourage supervisees to expose themselves to problematic issues to allow them to work their own way forward and to reflect on how they are doing. A supervisee does not want to be compared with their supervisors work or be told what to do. They want and need an equal professional relationship. This needs honesty on both sides. Both parties need to feel free to say how they are doing in their work (especially if it exposes vulnerabilities) and how they feel about the supervisory relationship. Challenges from both sides need to be embraced as an opportunity to grow rather than being seen as a criticism. Exploration and enabling the supervisee to explore what is going on is an important part of supervision. It is tempting as supervisor to respond with our own theories, interpretations and answers. However, supervisors need to encourage supervisees to explore and gain insight by asking respectful and leading questions. This helps supervisees conclude on their own to how they are doing and what they could do more effectively. Often questions that focus on past experiences, including positive ones can help encourage a new perspective. can be helpful for a supervisee. Supervisors need to support the supervisee to have the courage to be imperfect. Honest, encouraging feedback will help educate and develop the supervisee. When we trained as counsellors we learnt about constructive feedback – always sandwich bad comments in between good ones. Supervisors need to do the same – highlight the counsellors strengths before presenting areas for development and change. When feeding back the negative, supervisors need to focus on what the person is doing rather than comparing or criticising. In other words avoiding words such as ‘unethical’, ‘non-empathetic’. Descriptive feedback allows the supervisee to see what they have been doing. It is always better to ask a supervisee if they would like to hear what your own views. Remember you want to keep the relationship equal. Supervisors need to encourage the supervisee to assess their competencies and effectiveness. However, in addition they need to reflect on their own effectiveness. There needs to be opportunity for feedback on both sides. Also supervisors can reflect in their own supervision, as well as develop their own professional development. A supervisory relationship needs to grow. As Millar, Holloway and Henderson say…. We all have tendencies to move into judging and defensive positions at times, and we all make mistakes. When we can embrace these moments with compassion, it is gratifying to realise that they offer great opportunities for professional growth. 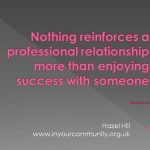 Hazel is an experienced supervisor and presently has a free slot available for online supervision. Ring or text 07814 363855 for more details.